That’s what we’re told. And yet, what do people actually do? Of course they do. We’re visual thinkers and take cues from book jackets to guide our decision making. Books are actually a lot like fashion (or a fashion accessory); readers have to want to be seen reading it. A book cover also makes a promise, and that promise has to be delivered on by the pages inside. 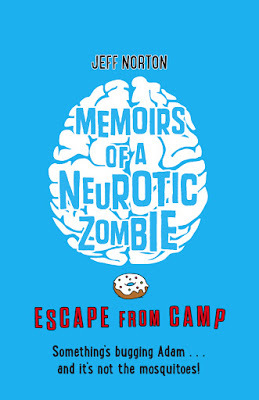 So with all of that in mind yesterday the awesome blog Middle School Strikes Back (the font of all new middle grade book news and views) revealed the new-look covers for the Memoirs of a Neurotic Zombie novels. The first book is getting a fresh coat of (yellow) paint and a snazzy new logo! 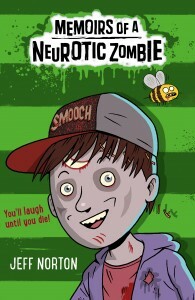 And the zombee is still there. Phew! I actually really liked the original cover, with the illustration of Adam Meltzer, but going out and doing so many school visits revealed that lots of readers expected the book to be a highly-illustrated, and younger skewing read than it actually is. And let’s be honest, people do judge a book by its cover. 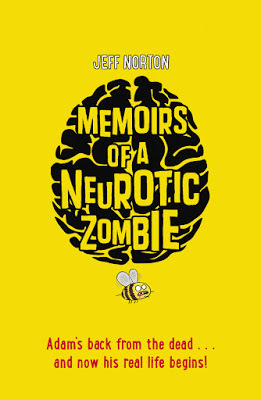 Big thanks to Faber and designer Will Steele for giving everyone’s favourite neurotic zombie a fresh new look!